It’s quiet here in Thirsty Kitten-ville this weekend. We are just getting used to the fact that the eldest of our flock (ok, we realize kittens do not have flocks) flew the coop last fall to go to college on the East Coast. And now, this weekend, Kip is shepherding our second oldest to look at colleges on the West Coast. Yes, this potentially means we could have a coast-to-coast empire in another year. But it definitely means that here at home this weekend, there are only two of us rambling around a house that is accustomed to having five– humans, that is. (For the record, there are also two hamsters, a dog and, of course, our Cat– perpetually a kitten in our hearts). Knowing we wouldn’t be able to sip wine together as usual this weekend AND not wanting to let our loyal readership down (by the way, thanks to all the readers from Down Under for the Aussie fan mail last week), Kip and I thought ahead and pulled out a special bottle from our cellar last Sunday. We used it as an excuse to cook ribeyes on the grill for our family dinner. What did we extract from the cellar? Glad you asked. We found one last bottle in our collection from Terra Valentine (why are we always finding that we are down to the last bottle of a favorite?!?). We have a special place in our hearts for Terra Valentine and this particular vintage seemed ready to open. 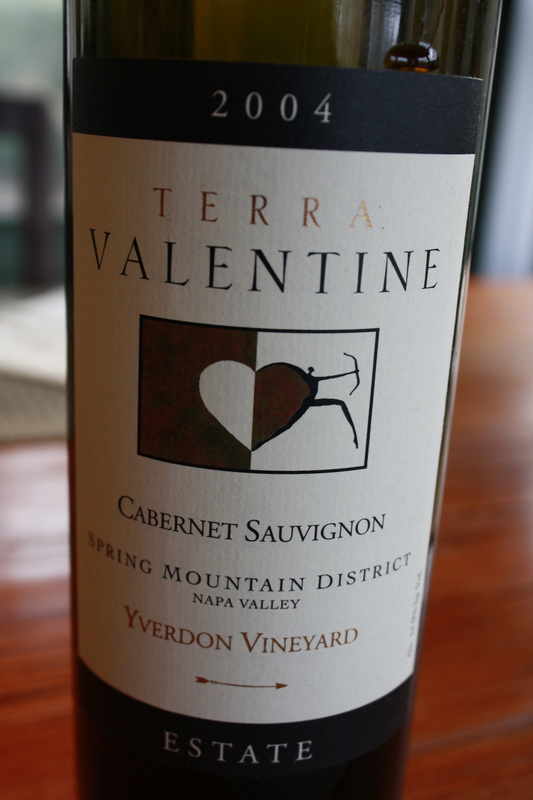 The 2004 Terra Valentine Spring Mountain District Yverdon Vineyard Cabernet Sauvignon was just begging to be uncorked. Kip and I visited Terra Valentine on our first trip to wine country in 2003. The winery was started by Angus and Margaret Wurtele, who happen to be from Minnesota which is where we live and, more specifically, where Kip grew up. The Wurteles are friends of Kip’s family so it was a natural place to stop on our first trip out. Angus Wurtele retired as CEO of Valspar Paint Company in Minneapolis in 1995. Apparently he fell in love with Napa Valley many years prior when he was in business school in California. He vowed to his wife Margaret that they would retire there. She was sure the fascination would pass. Margaret, a Minnesota native, is an author and publisher who has a myriad of other good works she is involved with, as well. Together, Angus and Margaret found a unique property in the Napa Valley when Angus retired and, thus, Terra (to honor the earth) Valentine (to honor Angus’ father) was born. On a gorgeous piece of land on Spring Mountain (just up the hill toward Sonoma from Napa’s St. Helena), Terra Valentine is headquartered in a castle-like building created by the man from whom the Wurteles bought the property. When Kip and I visited in 2003, we sipped wines in a beautiful library. We were captivated by the stained glass windows and stone construction that make the building look like something from the Old World. Even then, as a fairly young winery, we were swept off our feet by the quality of their wines. Wine Enthusiast rated the wine 93 points and recommended it would be best consumed between 2010 and 2016. We felt like we hit the nail on the head with our timing– 2012 seems the perfect time to sip this wine. We can’t imagine it could get any better than it is at this moment. So it reminds us that you don’t need a special occasion to open a special wine. It can simply be a Sunday night family dinner. A great wine, slowly savored, can focus the attention on what matters most– being together and enjoying the moment. We’ll have to uncork some of this when you are next here for a visit! Kitten, if your visits to the right coast ever land you in Philadelphia, we should definitely all get together and pull a few corks! Loved the article! Thanks so much, TDC. We’d love to pull a few corks with you and yours! Looking forward to your post(s) from your CA trip. I miss you too, Mom and Dad! Awww, Baby Kitten! Sending you heaps of love from the Kitten Nest!